With today’s constant digital feed of news both major and minor, it’s fascinating to think back to an era where newsreels supplied much of the world’s news in motion. In an era still ruled by newspapers and radio, newsreel series from The March of Time, Fox Movietone News, Universal Newsreels, British Pathé and others brought events from far corners of the world to local movie house audiences. Presenting news in motion with dramatic music, voiceovers, selective edits and even reenactments, newsreels provided important foundations for how people would eventually consume video news via television in the latter half of the 20th-century and online in the 21st-century. British Pathé announced this past week the availability of much of its archive of some 85,000+ HD videos available via YouTube. Some videos appear in their original full newsreels including iconic opening titles, graphics and voiceovers. The A Day That Shook The World series offers more modern edits of pivotal world events from a UK perspective. Other videos are mere snippets, often presented without sound or much context. Topics covered in the British Pathé newsreels range from celebrity, politics and British royalty to industry, disasters, contemporary slices of life and news from the British Empire worldwide. From the historical to the humorous to the downright bizarre, the newsreel collection paints a wide picture of nearly 100 years of life on Earth. For people with an interest in armed conflict of the 20th-century, the British Pathé collection has some gems. The Second Boer War gets a little coverage in some amazing footage from the years around the turn of the 20th-century. World War I is covered in major battles such as the Somme and Verdun, but also short features on new technologies like tanks and news from the home front. 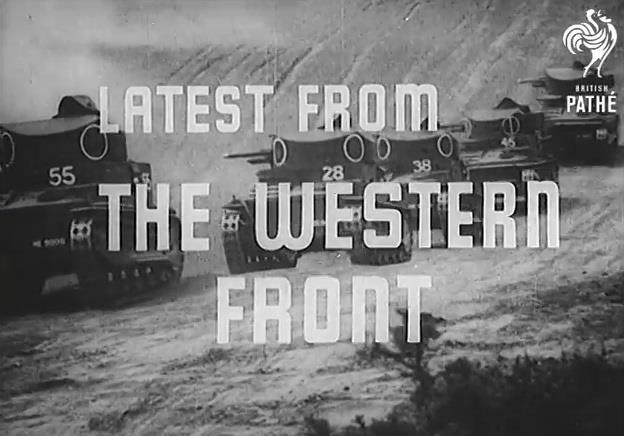 World War II coincided with the peak era of newsreels, and the British Pathé collection provides an amazing document. There are full newsreels covering the Battle of Dunkirk and the Battle of Arnhem from Operation Market Garden. The brutal siege and liberation of Stalingrad gets a lot of coverage, as does the major battles of the Pacific like Iwo Jima. Nail-biting aerial and naval combat from throughout the war is also documented in some stellar footage. There’s a ton of additional military-themed footage in the post-WWII era covering the Cold War events, the Korean War, the Vietnam War, the Six Day War and the Falkands War. Seeing history come alive in video vignettes from British Pathé, often with more than a glint of heroic propagandist presentation, is just another opportunity to view history as contemporary audiences once saw it. With more and more archives enabling wide distribution of their photo, film, map and document collections online, armchair historians everywhere can tap into a wealth of information painting an ever-widening picture of our past. The Battle of Guadalcanal between August 1942 and February 1943 was the first major Allied campaign set on crushing the Japanese foothold in the Pacific region. Fought in bloody air, sea and island engagements, the seven months of battle resulted in a significant shift in superiority to the Allies in the region and led to the beginnings of the downfall of the Japanese Empire in the Pacific. Most of my wargaming happens on dry land and usually somewhere in Europe. The Pacific War in WWII always seems so separate, sprawling and overwhelming to me with its mix of different combined combats, complex supply lines and different territorial agendas. That said, dabbling in this portion of the war gives me a chance to use some very different tactics and strategies I’m not used to gaming. 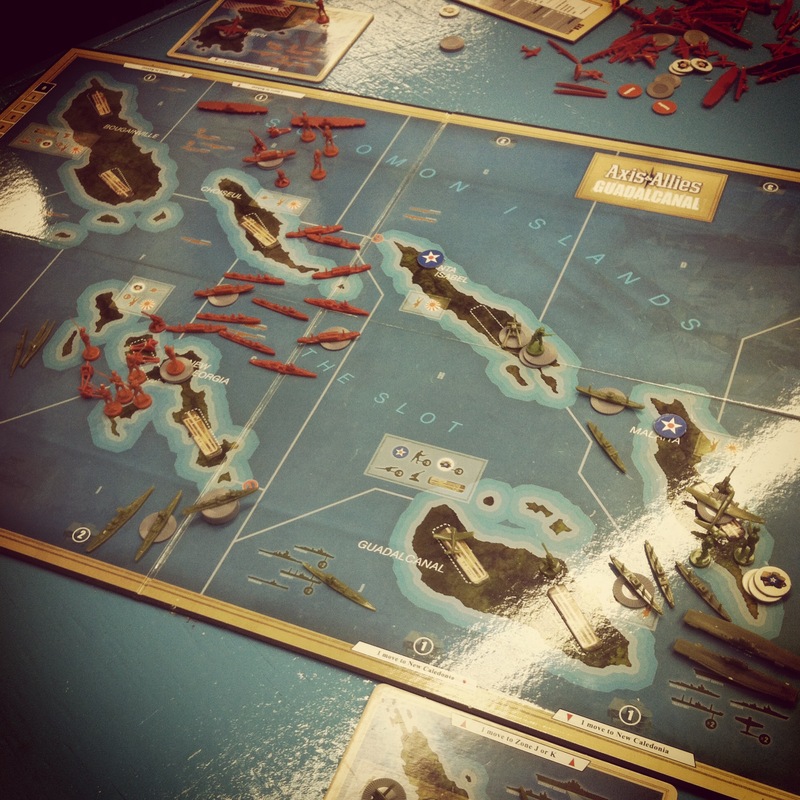 So, with a short couple of hours to spare recently at Metropolitan Wargamers in Brooklyn, NY, I tried my hand at some WWII Pacific action with Axis & Allies: Guadalcanal. 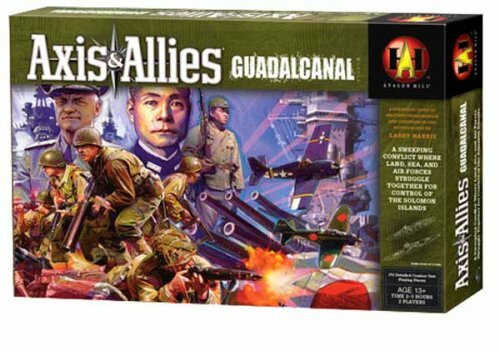 The popular Axis & Allies boardgame series from Avalon Hill (owned by Wizards of the Coast) has been around for more than 20 years and covers many specific eras, battles and theaters of WWII. More recently, a WWI game has also been added in time for the 100th-anniversary of that conflict. The A&A games are readily available from a number of book and department stores, and they vary in complexity and time commitment. Mt first introduction to the series was with the Spring 1942 game which weaned my younger son and I off much simpler war board games like Risk forever. 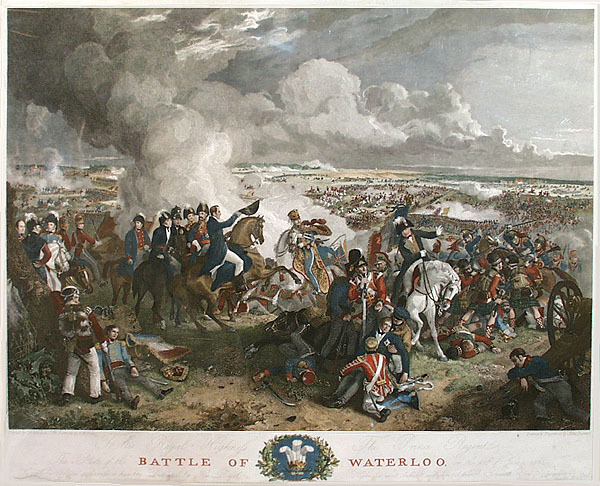 The great design, hundreds of sculpted plastic playing pieces, economic factors and combat mechanics make the A&A games a great way for old and new wargamers alike to engage in hours of very satisfying play. 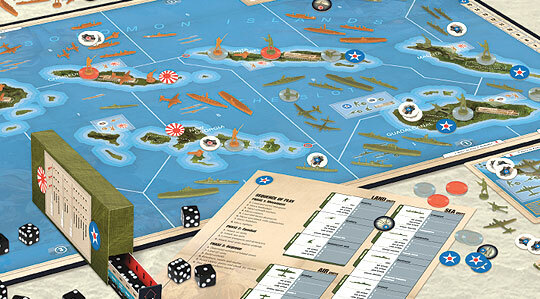 The Guadalcanal game presents a map of the South Pacific islands and sea zones contested by US and Japanese forces. Victory points are determined by building and controlling island airstrips. As in the actual campaign, quickly capturing islands and building airstrips is critical not only to endgame victory but in providing bases to supply and deploy additional forces. Aside from capturing islands, controlling the three main sea zones at the center of the board (aka “The Slot”) is key in controlling the transport of crucial supllies and reinforcements. The combat system in the game uses a “battle box” containing a dozen dice which are shaken and reveal various randomized target effects. With land, air and sea units crowding the board, the confused mass of combined arms is neatly accounted for with a few shakes of the unique battle box. In my first play as the Americans, I quickly captured the southern half of Guadalcanal while my Japanese opponent began a big push with his navy toward The Slot. In the second turn I was able to press on to Malaita and build a second airstrip of Guadalcanal to take an early lead in victory points. With the Japanese navy massing in the central sea zone I made a risky gamble in turn three sending in a huge air attack which destroyed a few ships and damaged a battleship but was repulsed with overwhelming deadly force. With a vastly-depleted air force, I scrambled to build myself back up as the Japanese built an airstrip on Bougainville and I made moves toward Santa Isabel. By turn four my navy headed west along the southern coast of New georgia in the hopes of catching the Japanese navy from behind. While I was able to destroy a number of Japanese submarines at the western edge of the island, my attack on Santa Isabel was halted and the Japanese took the game. A&A: Guadalcanal moves fast for two players, playing in about 2 hours. The short nature of the game makes every move from turn one onward important with little room for error. My lesson learned in the first game was not to run too fast toward facing-off against the superior Japanese fleet early, perhaps opting instead for a greater build-up of supply to gain island footholds to launch later game attacks. The Axis & Allies series is fantastic for out-of-the-box playability with the different game versions each offering realistically-specific game dynamics for several WWII theaters and battles. Not being a big Pacific War gamer, A&A: Guadalcanal makes for a perfect way for me to get my feet wet and expand a bit of my gaming experience to another corner of the 20th-century’s greatest conflict.